Chris Joseph Columbus (/kəˈlʌmbəs/; born September 10, 1958) is an American filmmaker. Columbus is known for directing films such as Home Alone (1990); its sequel, Home Alone 2: Lost in New York (1992); Mrs. Doubtfire (1993); Nine Months (1995); Stepmom (1998); Bicentennial Man (1999); Harry Potter and the Sorcerer's Stone (2001); its sequel, Harry Potter and the Chamber of Secrets (2002); Percy Jackson & the Olympians: The Lightning Thief (2010); and Pixels (2015). He is also known for writing films such as Gremlins (1984) and The Goonies (1985). Home Alone won a British Comedy Award for Best Comedy Film. Columbus received an Academy Award nomination for producing The Help (2011). Columbus was born in Spangler, Pennsylvania and raised in Champion, Ohio, the son of Mary Irene (née Puskar), a factory worker, and Alex Michael Columbus, an aluminum plant worker and coal miner. Columbus is of Italian and Czech descent. He graduated from John F. Kennedy High School in Warren, Ohio and went on to study at New York University's film school at the Tisch School of the Arts, where he was a schoolmate of writer/director Charlie Kaufman and Alec Baldwin. Although he received a scholarship, he forgot to renew it and was forced to take a factory job to pay for schooling. While on shifts he secretly worked on a 20-page screenplay, which one of his teachers would later use to help him get an agent. Columbus would later state the experience "saved my life" noting that he was able to experience "the terrifying reality I faced of having to live and work in that factory for the rest of my life in that town if I didn't make it". Columbus worked as a screenwriter with Steven Spielberg's Amblin Entertainment, working on Gremlins (1984), The Goonies (1985) and Young Sherlock Holmes (1985). He wrote the first episodes of the animated series Galaxy High (1986) and later made his directorial debut with the teen comedy Adventures in Babysitting (1987) and Heartbreak Hotel (1988). He was the producer of Harry Potter and the Prisoner of Azkaban (2004), the third film in the Harry Potter film series, and received an Academy Award nomination for producing The Help (2011). Columbus founded his production company named 1492 Pictures in 1995. The character types preferred by Columbus are the everyday American men, women, and children who struggle to uphold family traditions against a changing, sometimes intimidating society. In 1993, he said: "I can understand the validity of showing people the ugliness of the world, but I also think there is a place for movies to leave people with a sense of hope. If your film isn't going to do that, I just don't think it's worth making." Columbus created the House of Secrets book series with Ned Vizzini and co-founded a new animation studio called ZAG Animation Studios with Saban Capital Group and ZAG Entertainment. He is also a partner at production company, Ocean Blue Entertainment with 1492 Pictures cofounder Michael Barnathan and 1492 Pictures principal, Mark Radcliffe. In 2014, he formed another production company, Maiden Voyage Pictures with his daughter, Eleanor. In 1982, Columbus married Monica Devereux, with whom he has four children: Eleanor (born 1989), Brendan (born 1992), Violet (born 1994), and Isabella (born 1996). Columbus lives in San Francisco's Pacific Heights. His children attend or previously attended Saint Ignatius College Preparatory. He donated money to the school for a new building, and the school's "piazza" is named after him. Many of Columbus' family members —including his children, his wife, his late mother, his father-in-law, and his cousin Robert Ayres— have appeared in cameo roles in his films. Particularly, his own daughter, Eleanor, portrayed the Hogwarts student Susan Bones in the first two Harry Potter films. Columbus endorsed Democratic candidate Hillary Clinton in the 2016 U.S. presidential election. ^ a b c Wazir, Burhan (October 28, 2001). "Hogwarts and all". The Guardian. London. Retrieved April 28, 2010. ^ Europa Publications (2003). The International Who's Who 2004. Routledge. p. 346. ISBN 1857432177. ^ Janusonis, Michael (November 28, 1993). "Chris Columbus discovers a new joy in directing 'Mrs. Doubtfire'". Providence Journal. Retrieved November 5, 2009. ^ "Here's the Thing: Chris Columbus - WNYC". WNYC. September 16, 2013. Retrieved January 31, 2015. ^ a b c Lipworth, Elaine. "Chris Columbus: My dad said, 'Don't do a job you hate'". Guardian. Retrieved June 12, 2016. ^ Kellogg, Carolyn (April 18, 2013). "Chris Columbus and Ned Vizzini open up about 'House of Secrets'". Los Angeles Times. Retrieved May 3, 2013. ^ "Chris Columbus". Ocean Blue Entertainment. ^ "Michael Barnathan". Ocean Blue Entertainment. ^ "Mark Radcliffe". Ocean Blue Entertainment. ^ "Chris Columbus' Maiden Voyage Pictures Next Sets Sail For 'Mediterranea". Deadline Hollywood. Retrieved January 21, 2014. ^ Fleming Jr, Mike (June 30, 2011). "Karen Croner To Script 'Hello Ghost' Remake For Chris Columbus To Direct". Deadline. Retrieved March 18, 2017. ^ "The World of Zag release dates". The World of Zag. October 31, 2016. Retrieved July 16, 2017. ^ D'Alessandro, Anthony (February 12, 2018). "Chris Columbus To Write & Direct Fright Feature 'Five Nights At Freddy's' For Blumhouse". Deadline. Retrieved February 12, 2018. ^ "Rotten Tomatoes T-Meter Rating of ''Adventures in Babysitting''". Rotten Tomatoes. Retrieved February 10, 2013. ^ "Rotten Tomatoes T-Meter Rating of ''Heartbreak Hotel''". Rotten Tomatoes. Retrieved February 10, 2013. ^ "Rotten Tomatoes T-Meter Rating of ''Home Alone''". Rotten Tomatoes. Retrieved February 10, 2013. ^ "Metacritic Rating of Home Alone". Metacritic. Retrieved February 10, 2013. ^ "Rotten Tomatoes T-Meter Rating of ''Home Alone 2: Lost in New York''". Rottentomatoes.com. Retrieved February 10, 2013. ^ "Rotten Tomatoes T-Meter Rating of ''Mrs. Doubtfire''". Rottentomatoes.com. Retrieved February 10, 2013. ^ "Metacritic Rating of Mrs. Doubtfire". Metacritic. Retrieved February 10, 2013. ^ "Rotten Tomatoes T-Meter Rating of ''Nine Months''". Rottentomatoes.com. Retrieved February 10, 2013. ^ "Rotten Tomatoes T-Meter Rating of ''Stepmom''". Rottentomatoes.com. Retrieved August 11, 2013. ^ "Metacritic Rating of Stepmom". Metacritic. Retrieved February 10, 2013. ^ "Rotten Tomatoes T-Meter Rating of ''Bicentennial Man''". Rottentomatoes.com. Retrieved February 10, 2013. ^ "Metacritic Rating of Bicentennial Man". Metacritic. Retrieved February 10, 2013. ^ "Rotten Tomatoes T-Meter Rating of ''Harry Potter and the Sorcerer's Stone''". Rottentomatoes.com. Retrieved February 10, 2013. ^ "Metacritic Rating of Harry Potter and the Sorcerer's Stone". Metacritic. Retrieved February 10, 2013. ^ "Rotten Tomatoes T-Meter Rating of ''Harry Potter and the Chamber of Secrets'". Rottentomatoes.com. Retrieved February 10, 2013. ^ "Metacritic Rating of Harry Potter and the Chamber of Secrets". Metacritic. Retrieved February 10, 2013. ^ "Rotten Tomatoes T-Meter Rating of ''Rent''". Rottentomatoes.com. Retrieved February 10, 2013. ^ "Metacritic Rating of Rent". Metacritic. Retrieved February 10, 2013. ^ "Rotten Tomatoes T-Meter Rating of ''I Love You, Beth Cooper''". Rottentomatoes.com. Retrieved February 10, 2013. ^ "Metacritic Rating of I Love You, Beth Cooper". Metacritic. Retrieved February 10, 2013. ^ "Rotten Tomatoes T-Meter Rating of ''Percy Jackson & the Olympians: The Lightning Thief''". Rottentomatoes.com. Retrieved February 10, 2013. ^ "Metacritic Rating of Percy Jackson & the Olympians: The Lightning Thief". Metacritic. Retrieved February 10, 2013. ^ "Rotten Tomatoes T-Meter Rating of ''Pixels''". Rottentomatoes.com. Retrieved August 29, 2015. ^ "Metacritic Rating of Pixels". Metacritic. Retrieved August 29, 2015. 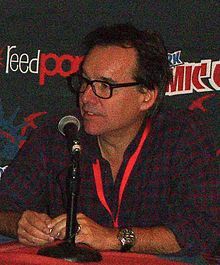 Wikimedia Commons has media related to Chris Columbus.